Tyler Warren RPG Battlers Pixel Style 3| RPG Maker | Create Your Own Game! 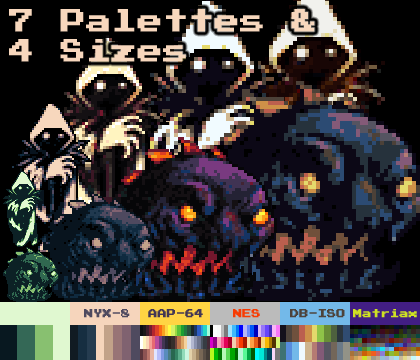 In response to many requests for more retro-pixel graphics needed by RPG game makers, Tyler Warren has completely remastered his monster collection in this; the 3rd of 3 pixel-style graphic packs. 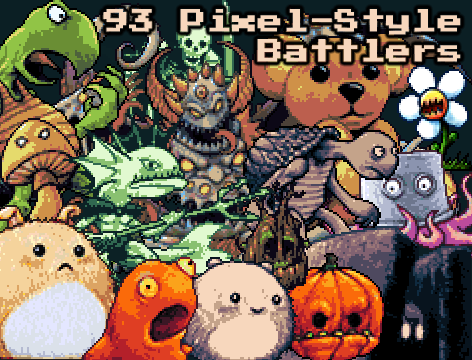 This pack is a careful assortment of 93 of Tyler’s battlers recreated in a pixel art style, presented in 7 different color palettes and 4 sizes, for an impressive total of 2,604 graphic image files in one pack. If you’re working on your retro or pixel game these are the monsters you need! This is pack 3 of 3, which together will recapture almost all of Tyler Warren’s battlers in pixel-style.